Far be it from me to defend the capitalist system, but can’t environmental organizations recognize that economic activity counts for something? 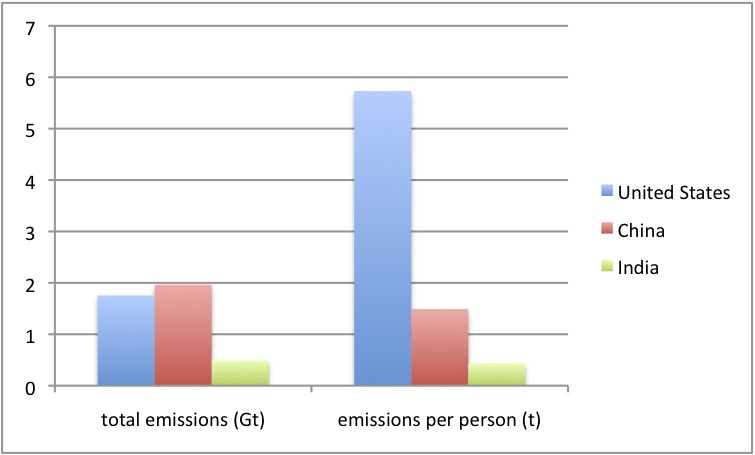 Invariably whenever the subject of carbon emissions, energy use, or other instances of mankind’s global “footprint” arises, the standard environmentalist narrative is all about how big the average American’s shoe size is. Paul Ehrlich is one of many who has retailed the idea that it is the Western, affluent, consumptive, materialistic lifestyle that is to blame for the world’s ills, just as much as “overpopulation,” if not more so. meaning “impact” equals population times affluence times technology. But as I’ve written elsewhere, when you actually analyze (pdf with more detail) the effect of modern technology on things like growing food, you find that impact per person stays constant — or even declines — as individual affluence grows. The amount of land used to grow food in America, for example, has remained virtually unchanged in a hundred years despite a tripling of population and a large increase in the consumption of high-quality protein (meat, e.g.). In other industries, technological improvements likewise allow for greater production with less input of energy or other raw materials. The message, as usual, was that although China has surpassed the U.S. in total carbon emissions, the U.S. generates much more per person. 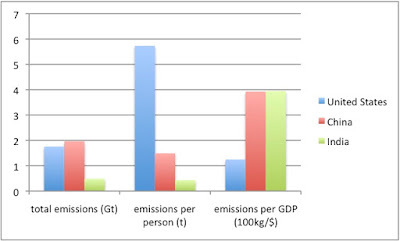 But what the Post, and environmental groups, never seem to look at is the impact per unit of economic production. The United States manufactures a lot of things the world needs and buys (food, airplanes, lumber, chemicals; in fact, the U.S. is still the largest manufacturer in the world, something most people don’t seem to know) and it does so at vastly greater energy efficiencies than do less developed countries. Of course to concede that technology is often good for the environment runs against the Calvinistic, anti-materialistic strain of the environmental movement — a strain that goes back to John Muir and Henry Thoreau at least — and which tends to view the planet’s ills as at heart a matter of personal guilt to be expiated through renunciation and penance. (A hilarious specimen of this was offered the other day by Prof. Kevin Anderson on Bishop Hill’s blog, where he explained earnestly how little he washes himself or his clothing in order to save the planet.) You even used to hear a lot of derisive comments within the environmentalist movement about “technological fixes,” as if that were somehow cheating (like buying indulgences). 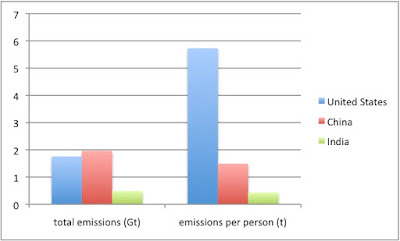 Per capita comparisons are fine if you want to emphasize the idea that energy use is a personal sin and that industry and commerce either don’t exist or are an evil in themselves, chargeable to our individual burden of sins by virtue of our citizenship in a country that is successful at these things. But a more sensible way of looking at it is that energy use is an unavoidable fact of existence — and so should be made in a way that produces the greatest buck for the bang.